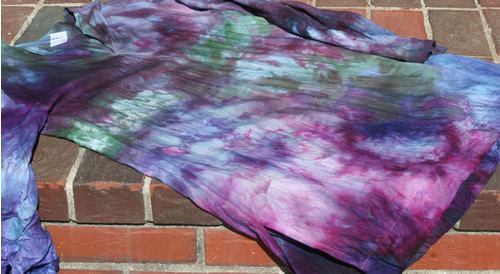 This is really a fun way to dye. Its only for cotton or vegetable dyeing**. I’ve done it with rayon, bamboo and cotton. The only differences are the inherent differences that the fibers themselves bring to the table. My directions here aren’t super pithy. They’re assuming that you already know how to do cotton dyeing. 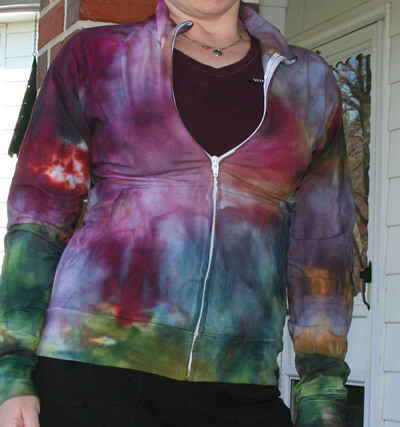 If you are unfamiliar with making tie dyes or cotton dyeing please grab a book and read up on how it’s done. The steps are really easy. The hard part is the waiting. 1. 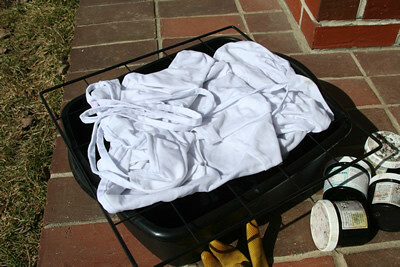 Soak the item you want to dye for a few minutes. I soak it in warm water and soda ash which is the setting agent for the Fiber Reactive dyes. If I’m using an item that I got at Goodwill I will wash in Synthropol to make sure there is nothing on it that will inhibit dyeing. If I got the item from a place that sells blanks for dyeing, then I don’t bother usually. Some will still tell you to wash carefully first and if you don’t like surprises, you may want to follow that advice. Me, I like surprises. 2. Place your item on the rack over the basin. You can fold but you probably don’t want to heap it into one massive pile. You want all the dyes to get a chance to work on this and if you make knots or hard folds and pile to deeply then there will be white areas. White areas are good, but only if that’s your goal. 3. Pile on your snow or ice. Not too thin, not to thick, I usually use about 3 inches or so. Snow is really nice and even, I’ve not done this with ice because that takes slightly more effort here in the snowy north than it does to walk outside and grab piles of snow. 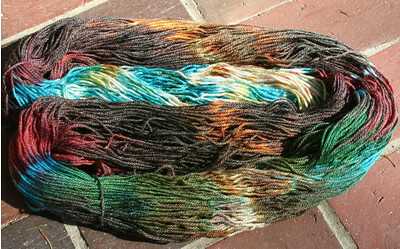 Note that how it piles the way the dyes will shift. Faster through thinner parts, slower through thicker parts….this will change the overall look. 4. 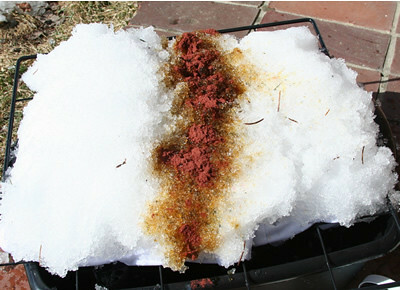 Apply the dye to the top of the snow. Just powder, right from the jars, sprinkle it right on to the snow. Leave white areas, or don’t. That clock will feel like the time is going back wards. What’s easiest for me is to do this just before my work day ends, leave it at work and in the morning I get to work and have a surprise. There is little control to this, you’re letting the snow paint your project. You can speed it up by having it in a very warm room but the faster it melts the more likely you are to have white. 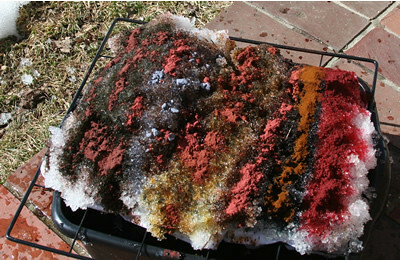 The slower it melts the more time you give all the colors to move and blend at their own pace. Patience will provide a different looking piece than it will if you add heat. 6. 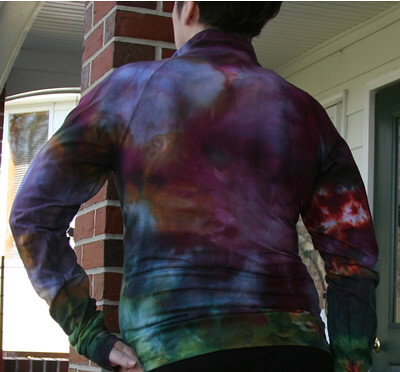 Rinse and wash and do all the things you’re supposed to do to finish off as if you had done a tie dye. **Why only vegetable products? Why can’t I do this with protein items? I tested it and I’ll tell you my thoughts. Protein requires heat to set it. In the cotton process as the dye hits the item it starts to set immediately. This makes the colors splotchy and vibrant. 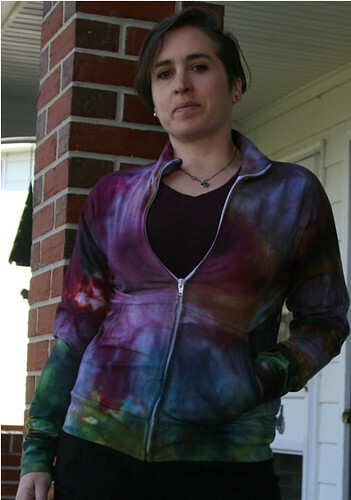 Doing this with protein, it wouldn’t set, you’d have to wait til the colors moved through and then you’d need to set it. Not a big deal. 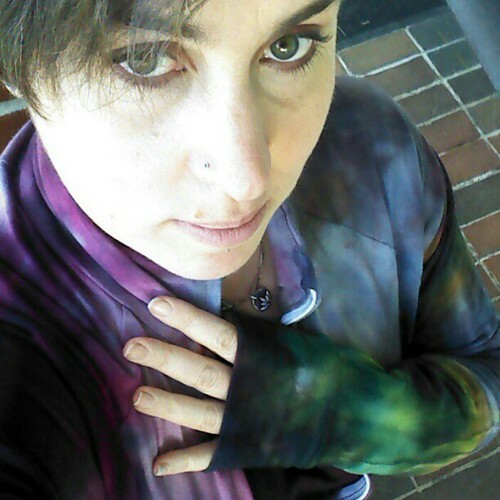 But, the items that I did dye like this, were no better (maybe worse) than when I dye them in a conventional way and I use less dye in the conventional way. 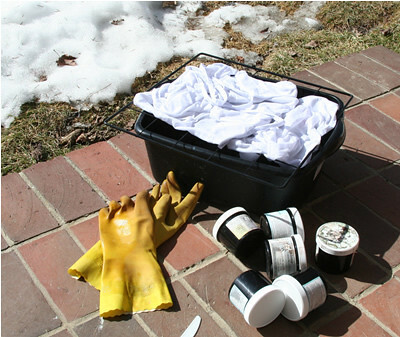 I feel like snow dyeing with the items I dyed, was a waste of powder. But, I’m not one to really deter you from playing. Go ahead and give it a go anyway. 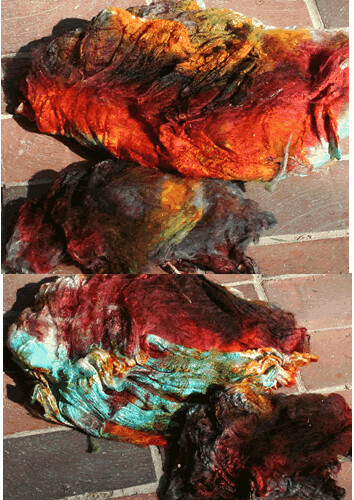 You might like what you create, it will surely be different than the vegetable products dyeing with this method. ***You don’t HAVE to use snow. You can use ice cubes or better crushed ice. 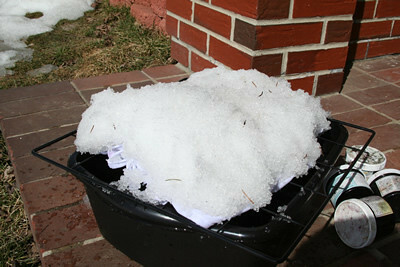 Pull out your Snoopy Snow Cone maker and get to making some shaved ice. The reason that I like the snow is that it’s small crystals and even. The ice melts differently. The larger it is, the more different your spots will be. Also, you will need sides on your tub (unlike how I show) because snow packs, and ice doesn’t. Give ice a go and see what you think.